This was one of the books I decided to read to pique my interest in architecture, written by the famous Le Corbusier, pioneer for modern architecture. 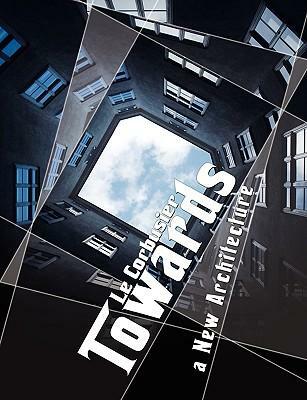 The 2008 publication features an interesting photomanipulation of a view looking up at a building from a central courtyard. The fragmented image by straight lines and the way the text follows in different sizes is very interesting, and definitely grabs my interest. The text was originally written in French, and this publication is said to have a better translation than prior ones. Despite the text being written originally in 1920s, it is easy to understand and will definitely raise questions and ideas in your mind you wouldn't have thought about before. Split into seven "essays", the book talks about Mass, Surface, plan, regulating lines and mass production of houses using many examples including liners, airplanes and automobiles, as well as a closer look at Roman architecture. The Parthenon is also referenced many times. The text is complimented by hundreds of line drawings, photographs and picture sources, which will aid you as you read, giving you real examples and a more visual guidance to what is being discussed. You would have no idea about any of this if it wasn't for the pictures, and it helps phenomenally in identifying architectural features and theories described. My basic architectural knowledge has definitely increased since reading the book, and though I may not understand EVERYTHING that is in here, it does build a foundation and ideas are planted, which upon revisiting, I'm sure will become clearer. Also what I got for myself is an appreciation for architecture. It will open your eyes to observing buildings and other man made objects. I feel slightly more sensitive to engineering and construction, simply because it is fascinating. My observation to fmy own personal surroundings will also be heightened as no doubt it affects our behaviour and feelings. I think the thing I like best about the book is the open end. The last chapter, titled "Architecture or Revolution" questions the future of architecture and whether we are moving too fast for ourselves to keep up (revolution) and our awareness of architecture and surroundings. The book lays down some key principles in architecture, but also raises some great questions for example which is more important, form or function? The book has taught me to be more critical of architecture and design, to raise questions and form my own view of things. Whilst the book may be geared towards architects and perhaps engineers, anyone can benefit from a read like this and hopefully be inspired in some way. This sort of clever work and exposure! Keep up the good works guys I've included you guys to our blogroll.